A framework for linking NAPs and NDCs. The four quadrants are described in the text below. With the Paris Agreement’s entry into force, the focus is shifting towards its implementation—in particular, countries are looking at how to meet the commitments they set out in their Nationally Determined Contributions (NDCs). Although not mandatory, many countries are choosing to include an adaptation component in their NDC in addition to setting out their mitigation commitments. The importance of adaptation is also emphasized within the text of the Paris Agreement itself, which includes a call for all countries to engage in national adaptation planning processes. The goals of the National Adaptation Plan (NAP) process—established under the 2010 Cancun Adaptation Framework under the United Nations Framework Convention on Climate Change (UNFCCC)—are for countries to build resilience to the impacts of climate change through medium- to long-term planning, and to integrate adaptation considerations into all relevant policies and strategies. NAP processes are an important part of implementing the Paris Agreement. But in light of adaptation not being a requirement in its signature vehicle—NDCs—how do we map out the links between NAPs and NDCs? There is clearly an opportunity to streamline and leverage the two to improve adaptation planning and action, but the starting point for doing so may not be entirely clear. If we understand NDCs as setting out high-level objectives and a vision that a country hopes to address through its adaptation efforts, and we understand NAPs as a country-driven, national-level process to integrate adaptation into planning processes and implement adaptation priorities in the NDC (as described here), the two become mutually reinforcing. Is there a NAP process currently underway in the country? Was adaptation included in the country’s NDC? If these questions are placed along two axes, as in the figure above, countries can identify the quadrant that best reflects their starting point, and explore how they can (or might eventually) link their NDC and NAP processes. Regardless of which quadrant a country may start in, it is possible to move among the quadrants while linking their NAP processes and NDCs. We recognize that this figure is simplified for illustrative purposes, and there may also be interim degrees of progress in the NAP process or the extent of coverage of adaptation in NDCs beyond “yes” or “no.” Given the intention under the Paris Agreement for countries to ramp up their commitments over the years, countries may choose to begin with a brief or simple adaptation component (or no adaptation component at all) and build upon it over time. Countries may have both a well-developed NDC adaptation component and a NAP process that is well underway: in these cases, countries may approach the NAP process as a framework for implementing the NDC commitments at the national level and producing inputs for updating the NDC adaptation component in the future. Simultaneously, they can use the NDC to build political support for the NAP process and its implementation, and to communicate the outcomes of the process internationally. 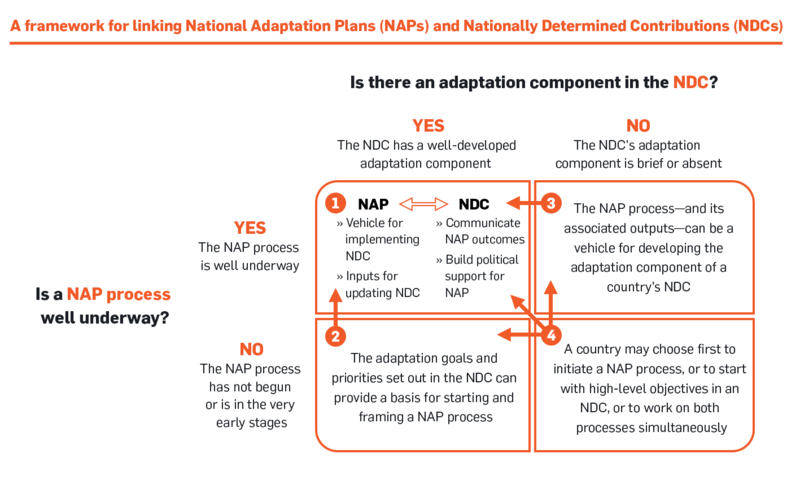 Countries that included an NDC adaptation component without having made much progress in the NAP process could use the vision that their NDCs set out to guide the NAP process and use it as a framework for meeting the NDC’s adaptation commitments. The high-level political attention that NDCs garner can also help to build political support for national adaptation planning and action. A country can therefore leverage the NDC adaptation component to move from quadrant 2 to quadrant 1 as appropriate. Peru’s NDC, for example, sets out the country’s high-level adaptation priorities, and notes that the NAP process will be the instrument for complying with the NDC—their NAP process began in late 2015 after their INDC was submitted. On the other hand, for countries that have not included an adaptation component in their NDC or that are endeavouring to develop their adaptation contributions further in future years, the NAP process and its results could be used to inform the development of future NDCs. Countries will have the opportunity to revise their NDCs every five years, alongside a global stocktake assessing collective progress and a push to increase ambition with new commitments. Therefore, there will be opportunities for countries to move from quadrant 3 to quadrant 1 as they see fit. Botswana, for example, includes a brief adaptation component in their NDC that notes how their NAP process will help the country to identify and address adaptation priorities in a systematic manner that is also aligned with their development priorities. Botswana’s NDC states: “The outcome of this process will be significant in guiding how the country responds to the development challenges across all sectors that are attributed to global warming and climate change.” This is an important acknowledgement of the iterative nature of the NAP process, with ongoing monitoring and review of progress in the process intended to inform how a country should adjust course as needed to adapt in the medium to long term. This ongoing monitoring and review could also be used to inform future adaptation NDCs and priorities included. Finally, some countries may not have a well fleshed-out adaptation component in their NDC, and also not yet have made much progress in the NAP process. From this quadrant 4, a country may choose first to initiate a NAP process, or to start with high-level objectives in an NDC, or to begin working on both processes simultaneously—depending on what best suits the country context, it is possible to move towards any of the other quadrants. With a focus on coordination at the core of our activities, it is crucial for the NAP Global Network to consider linkages between the different initiatives and agendas to which countries are being asked to respond, and in which donors wish to support developing country partners. The Network will continue to work with its broadening base of participating countries to think through the linkages between NDCs and NAPs in their country context—from planning through to implementation and monitoring and evaluation. This is also important for the bilateral development partners we work with to understand how they can best align their support with the adaptation priorities that countries are identifying through the mutually reinforcing NAP processes and NDCs. This blog post is based on a presentation originally made by the NAP Global Network Secretariat, IISD, on November 13 at Development and Climate Days in Marrakech, Morocco. View the presentation below, and stay tuned for future blog posts on the links between the NAP process and other aspects of the global climate and development agenda—including the Sustainable Development Goals (SDGs). Countries first submitted Intended Nationally Determined Contributions in the lead-up to COP 21, and commit to Nationally Determined Contributions (dropping the “I”) when they sign and ratify the Paris Agreement. With a few exceptions, most countries to date have not made changes when converting their INDC to their NDC. This blog uses the term NDC throughout for consistency unless referring to a specific INDC, although acknowledging that not all countries have made the transition yet.